Jef and I look forward to the weekend - who doesn't? After waking up early and spending over 8-9 hours working every day for an entire week we feel pretty spent by the time Friday afternoon rolls around. Yay for the weekend. Yay for a break. Yay for some fresh air (figuratively and literally) away from offices and air conditioning. Last Saturday we headed out to visit friends at their farm in Clevedon. I was hungry! It as my last weekend for foraging (I was on my 18th day at that point) and I was ready to eat just about anything (and everything). We got to the farm and ate plums and peaches from the orchard. It was satisfying, but we needed something else. So off we went for a walk across the paddocks to the beach opposite their farm in search of oysters. The tide was out so it was the perfect opportunity to get ourselves some protein. 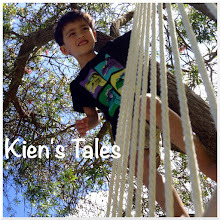 Kien was more than happy continue jumping on the trampoline instead of coming out on the long trek with us. We finally got to the spit and the rocks and collected some oysters in our onion sack. Just enough for a decent feed. They were not big oysters, but provided us with some much needed protein. Sunday we went for a sail. It was windy out there and was blowing in the opposite direction from where we needed to go. After zigzagging all the way up the harbour we decided to stop at North Head and anchor up at Devonport. It was actually a pretty good spot to anchor; nice and sheltered tucked away in Torpedo Bay. Kien wanted to take some selfies. He was being so silly it was hilarious. He could not stay still to save himself. It was such a fun way to spend time together on a Sunday. Now I'm looking forward to more weekending!